The 10 dollar gold coin, also known as the Gold Eagle, was created as the base unit for gold currency in the United States. Let me see if I can make this easy to understand. The cent - equal to 1/100th or .01 dollars. The dime - equal to 10 cents. The dollar - equal to 10 dimes. The eagle - equal 10 dollars. Then the Eagle was set as the basis for the Quarter Eagle, Half Eagle, and Double Eagle. The Gold Eagle was produced from 1795 to 1933, except for the years 1805 to 1837. Information about the major designs of the United States 10 dollar gold coin is available below. The Turban Head Eagle 10 dollar gold coin, also referred to as Capped Bust To Right, was produced by the United States Mint from 1795 to 1804. Small Eagle reverse - 1795-1797. Heraldic Eagle reverse - 1797-1804. Only 132,592 of these coins were minted and few survived. Most were melted down for their gold content. The Turban Head Gold Eagle coins are extremely rare and expensive. After the last Turban Head $10 Gold Eagle left the mint in 1804, no more $10 Gold Eagles would be produced by the United States Mint until 1838 when production began for the Liberty Head Gold Eagle. In 1838, after more than 30 years since production of Turban Head Eagles had stopped, the Eagle 10 dollar gold coin appeared once more. The Liberty Head $10 Gold Eagle was produced from 1838 to 1907. The weight and diameter were reduced from the earlier Turban Head design and both the obverse and reverse of the coin were redesigned. Liberty now faces to the left wearing a coronet that bears the word LIBERTY. The eagle on the reverse now appears more natural and the value, TEN D. is added. These coins are very popular among collectors, possibly because they are one of the most affordable of all the gold US coins. 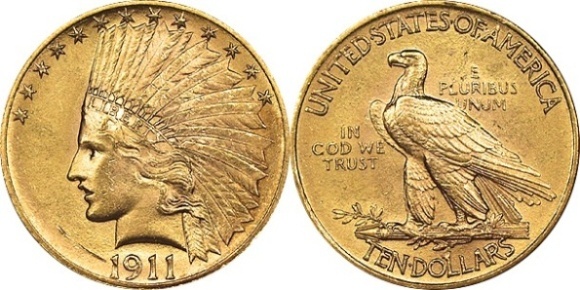 In 1907, Liberty received a shocking makeover for the Indian Head Eagle 10 dollar gold coin. Designed by Augustus Saint-Gaudens, she is shown wearing an Indian war bonnet. After the initial shock wore off, however, this new design was accepted by the public and has since become viewed as one of the most beautiful U.S. coins and a favorite design of many collectors. The edge of the Indian Head Eagle also has an interesting design. 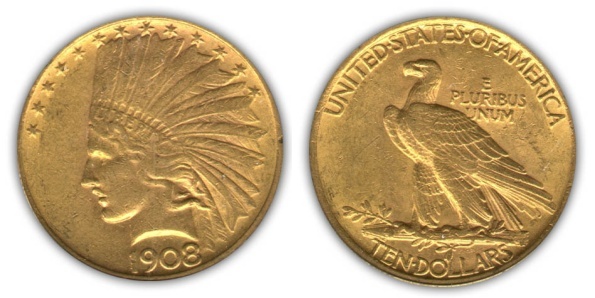 Instead of the reeded edge of most other gold US coins, the Indian Head has raised stars around its edge. 1908-1911 dates have 46 stars, one for each state in the Union. Two more were added in 1912 for the two new states added that year. The original Indian Head Eagle design did not include the words IN GOD WE TRUST. President Roosevelt didn't think it was proper for use on coins that could be used for gambling or other illicit purposes. The motto was returned to the coin however, in 1908 by an act of Congress and would remain there for the duration of its production.